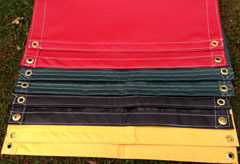 Poly - Use Tarps Direct's Poly Triage tarps when you require a lightweight, economical set of Triage Tarps. All four colors - minor green, delayed yellow, immediate red and deceased black - are included in the set. These are a valuable tool for emergency responders, schools or any other organization that the need may arise. Allows quick and easy organization/classification of victims. Weights range from red and yellow being our 3.3 oz, green is 4.5 ounce and black is 6.0 ounce. Other size options are available. 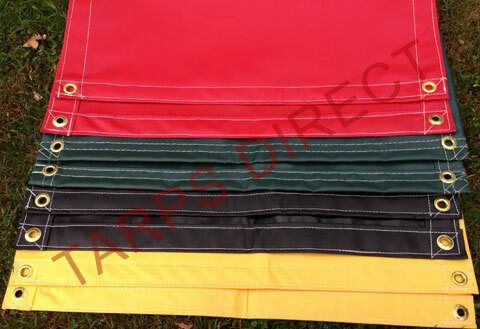 If you are looking for a heavier weight of tarps or custom sizes, refer to VINYL Triage Tarp Sets. All tarps are listed as cut size and finish smaller by 6" or 3 % to 5 % smaller. Vinyl -Use Tarps Direct's 13 ounce Vinyl Laminated Polyester (VLP) Triage tarps when you require a durable, hardworking set of Triage Tarps. All four colors – minor green, delayed yellow, immediate red and deceased black- are included in the set. 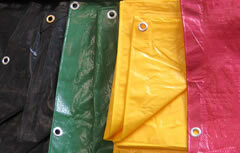 Triage tarps are a valuable tool for Emergency Responders, schools or any other organization that the need may arise. Allows for quick and easy organization/classification of victims. Meets NFPA-701 and CA Fire Marshall Flame retardant specifications. If you are looking for a lighter weight or economy tarp set, refer to Poly Triage Tarp Sets. All tarps are listed as cut size and finish smaller by 6" or 3 % to 5 % smaller. Custom sizes available. Please call for price and delivery. Swatch samples available upon request. Vinyl - Use Tarps Direct's 18 ounce Vinyl Coated Polyester (VCP) Triage tarps when you require a durable, hardworking set of Triage Tarps. All four colors - minor green, delayed yellow, immediate red and deceased black - are included in the set. 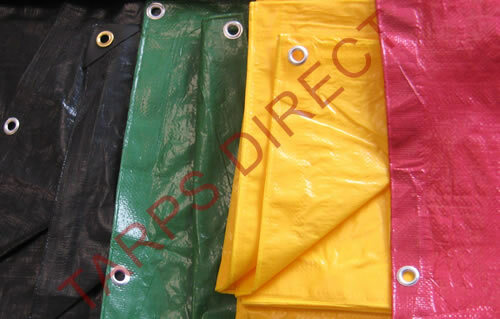 Triage tarps are a valuable tool for emergency responders, schools or any other organization that the need may arise. Allows for quick and easy organization/classification of victims.